This is a view of the Children's room of the Weston Library. 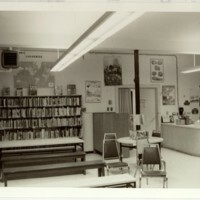 Book-lined walls, wooden benches and a stand-up book display is visible in the image. Various posters are also visible plastered on the wall. This website was created as part of the Weston Library Centenary Project, developed by the Toronto Public Library in partnership with the Weston Historical Society. The project was funded by Human Resources and Development Canada.